Leukotriene B4 is a proinflammatory lipid mediator generated by the enzymes 5-lipoxygenase and leukotriene A4 hydrolase. Leukotriene B4 signals primarily through its high-affinity G protein-coupled receptor, BLT1, which is highly expressed on specific leukocyte subsets. Recent genetic studies in humans as well as knockout studies in mice have implicated the leukotriene synthesis pathway in several vascular pathologies. In this study, we tested the hypothesis that BLT1 is necessary for abdominal aortic aneurysm (AAA) formation, a major complication of atherosclerotic vascular disease. Chow-fed Apoe−/− and Apoe−/−/Blt1−/− mice were treated with a 4-wk infusion of angiotensin II (1000 ng/min/kg) beginning at 20 wk of age, in a well-established murine AAA model. We found a reduced incidence of AAA formation as well as concordant reductions in the maximum suprarenal/infrarenal diameter and total suprarenal/infrarenal area in the angiotensin II-treated Apoe−/−/Blt1−/− mice as compared with the Apoe−/− controls. Diminished AAA formation in BLT1-deficient mice was associated with significant reductions in mononuclear cell chemoattractants and leukocyte accumulation in the vessel wall, as well as striking reductions in the production of matrix metalloproteinases-2 and -9. Thus, we have shown that BLT1 contributes to the frequency and size of abdominal aortic aneurysms in mice and that BLT1 deletion in turn inhibits proinflammatory circuits and enzymes that modulate vessel wall integrity. These findings extend the role of BLT1 to a critical complication of vascular disease and underscore its potential as a target for intervention in modulating multiple pathologies related to atherosclerosis. Amounting body of correlative evidence has linked the leukotriene synthesis pathway to several chronic inflammatory conditions, including atherosclerosis. 5-Lipoxygenase (5-LO)3 and its derivatives are highly expressed within human carotid, aortic, and coronary artery plaques (1, 2, 3). Furthermore, genetic studies have associated particular variants of 5-LO, its accessory protein 5-LO-activating protein, as well as the enzyme leukotriene A4 (LTA4) hydrolase with stroke and myocardial infarction in humans (4, 5, 6). Functional studies in murine models have begun to address the role of bioactive lipid products in atherogenesis and related complications, including abdominal aortic aneurysms (AAA; Ref. 7). AAAs are caused by pathological changes in the aortic wall that lead to segmental weakening, progressive dilation, and spontaneous rupture (8). Chronic inflammation of the aortic wall and proteinase-mediated degradation of structural matrix proteins are believed to contribute to the development of AAA (9), although the precise molecular mechanisms that underlie vessel wall changes remain poorly understood. Zhao et al. (10) recently demonstrated that 5-LO plays a striking role in aortic aneurysm formation in a cholate-induced model. Interestingly, although 5-LO deficiency had a pronounced effect on aortic dilation, no effect was observed on stenotic atherosclerotic lesions, suggesting that the pathological processes contributing to aneurysm formation vs plaque formation may be different. 5-LO generates both pro- and anti-inflammatory pathways (11); consequently, the cumulative effects of its inhibition might vary in different pathological contexts. Furthermore, the authors demonstrated that the cysteinyl leukotriene, LTD4, was sufficient to induce the expression of the chemokines MIP-1α by MM6 monocytic cells and MIP-2 by HUVECs, suggesting that the cysteinyl leukotriene pathway downstream of 5-LO may play a functional role in aneurysm formation by potentiating inflammatory circuits. However, the bioactive lipid(s) downstream of 5-LO necessary for aortic dilation remain to be definitively identified. Leukotriene B4 (LTB4) is an eicosanoid lipid mediator generated by a pathway downstream of 5-LO involving LTA4 hydrolase. LTB4 is a proinflammatory mediator that activates multiple leukocyte subsets leading to cell recruitment, production of reactive oxygen species, and induction of gene expression (12, 13, 14). LTB4 signals primarily through its high-affinity G protein-coupled receptor, BLT1, which is highly expressed in specific subsets of circulating peripheral blood leukocytes, as well as on nonleukocytes including endothelial cells and smooth muscle cells (SMC; Refs. 15 and 16). A low affinity receptor, BLT2, is also ubiquitously expressed at low levels in many human tissues (17, 18). Two groups have recently demonstrated as much as a 2-fold reduction in atherosclerotic plaques in Apoe−/−/Blt1−/− compound-deficient mice as compared with Apoe−/− controls (19), although a role for BLT1 in aneurysm formation has not been previously addressed. In this study, we tested the hypothesis that BLT1 contributes not only to atherosclerosis generally, but specifically to AAA formation. This study defines key participants downstream of 5-LO in AAA formation and reveals novel interactions between BLT1 and enzymes that modulate vessel wall stability. In contrast to studies modulating the upstream enzyme 5-LO, inhibition of BLT1 has concordant effects on both AAA and stenotic plaque formation. These findings extend the role of BLT1 to a critical complication of vascular disease and underscore its potential as a target for intervention in modulating multiple pathologies related to atherosclerosis. Blt1−/− mice (12) were backcrossed 10 times into a C57BL/6J background and subsequently bred with Apoe−/− mice (20) (The Jackson Laboratory). Intercrosses of Apoe−/−/Blt1+/− mice yielded offspring that entered the study. Genotyping for BLT1 (12) and Apoe (21) was performed by PCR. All mice were fed a normal chow diet. Institutional approval was obtained for all experiments described in this manuscript. A total of 0.5–1.0 ml of blood was obtained from experimental mice by right ventricular puncture upon euthanasia. A small aliquot of blood was analyzed for complete blood count (Drew Scientific Group), and the remainder was used for enzymatic colorimetric analysis of total cholesterol and triglyceride levels (Roche Diagnostics). Apoe−/− and Apoe−/−/Blt1−/− mice were treated with Ang II (1000 ng/min/kg; Sigma-Aldrich) or vehicle control via ALZET model 2004 osmotic pumps (ALZA Corp.) beginning at 20 wk of age as previously described (8). After 4 wk of infusion, mice were sacrificed for blood collection, and aortas were dissected. Systolic blood pressure was measured serially in conscious mice using a tail-cuff system (Kent Scientific model XBP1000) during three training sessions at baseline and then 1 wk after the placement of the Ang II pump. Aortas were dissected from mice of the indicated age and pinned on a black wax board; images were obtained with a Nikon Coolpix camera (Nikon) attached to an inverted microscope as previously described (15, 22). Aortic diameter and area were determined by IPLab image analysis software (BD Biosciences). Measurements were conducted by a single observer blinded to the genotype and treatment of the mice. Suprarenal aortas were isolated after perfusion of mice with paraformaldehyde (30 ml) under physiological pressure and then embedded in OCT. Serial 5-μm sections were cut, and every fifth section was stained with H&E. Immunohistochemistry was performed with Abs to identify SMCs (α-actin, 1/100; Abcam), macrophages (Mac3, 1/20; BD Pharmingen), and T cells (CD4, 1/50; BD Pharmingen) as previously described (15). 5-LO and LTA4 hydrolase were detected by goat anti-mouse Ab (Santa Cruz Biotechnology; dilution, 1/30). MMP2 and MMP9 were detected by rabbit anti-mouse Ab (Chemicon; dilution, 1/25). Negative controls were prepared with substitution with an isotype control Ab or nonimmune sera. Stained sections were digitally captured, and quantitative analysis was performed with IPLab image analysis software (BD Biosciences). Threshold color analysis by a single observer quantified areas stained for a particular Ag and total lesion area. We divided areas stained for a particular Ag by total lesion area to account for variability in lesion size. Total RNA was isolated from suprarenal aortas (between the subclavian artery and the takeoff of the right renal artery) from mice perfused with buffer RLT (Applied Biosystems) using mechanical homogenization with a rotostator and RNeasy (Qiagen) columns (22). Briefly, after DNase I digestion, equivalent amounts of RNA from each sample were reverse transcribed using TaqMan reverse-transcription reagents, including oligo(dT)15, random hexamers, and Multiscribe reverse transcriptase (Applied Biosystems). Quantitative RT-PCR (qPCR) reactions were conducted with the Multiplex QPCR system as described (22). Amplification plots were analyzed with MX4000 software, version 3.0. Gene expression was normalized to GAPDH or β2-microglobulin as an internal control. Whole aortas were homogenized in ethanol and centrifuged, and supernatants were passed over C18 Sep-Pak columns (Waters). After drying with nitrogen gas, the residue was dissolved in an extraction buffer for ELISA assay as per the manufacturer’s recommendations (Neogen). Human monocytes were purified from healthy donors by Ficoll-Hypaque density gradient centrifugation at 15°C (lymphocyte separation medium; Organon Teknika) followed by negative selection magnetic bead purification (Miltenyi Biotech) to >92% purity as previously described (23). Monocytes were stimulated at 37.5°C with vehicle control, 100 nmol/L LTB4 in RPMI 1640, 100 nmol/L LTD4 in RPMI 1640, or LPS (100 ng/ml) in RPMI 1640 for 6 h. Reactions were stopped on ice. RNA extraction from cells was performed using RNeasy columns, and qPCR reactions performed as described above. Secreted proteins in the supernatant were measured using human ELISA kits for MCP-1 (R&D Systems), IL-8 (R&D Systems), and MIP-2 (PeproTech). Data were analyzed with SigmaStat (Systat Software) using Student’s t test and two-way ANOVA as indicated. Aneurysm incidence was analyzed by Fisher’s exact test. For the RT-PCR studies, transcript levels were compared using one- or two-way ANOVA. When significant differences were found, Tukey’s post hoc test (honestly significant difference) was used to perform pairwise comparisons of group means. A probability value of <0.05 was considered statistically significant. All data are reported as mean ± SEM or SD as indicated. All mice were placed on a normal chow diet for 20 wk and then treated with Ang II (1000 ng/min/kg) or vehicle control via ALZET osmotic pumps for 4 wk, which generates AAA in a reproducible manner, mimicking many of the important features of the human disease (8, 24). We first examined the expression of BLT1 in this model by qPCR of suprarenal mouse aortas, given that Abs to the murine BLT1 receptor are not available (Fig. 1⇓A). Ang II does not typically generate AAA in control C57BL/6J mice, and BLT1 expression was low in both the untreated and C57BL/6J treated cohorts. In contrast, we found significant up-regulation of BLT1 expression in the aortas of hyperlipidemic Apoe−/− mice, particularly after Ang II treatment. We similarly documented the up-regulation of the BLT1 ligand, LTB4, in the Ang II-treated, hyperlipidemic mice (Fig. 1⇓B). A, BLT1 mRNA expression in suprarenal aortas as assessed by qPCR. After 4 wk of Ang II treatment, mice were sacrificed, and aortas were perfused with buffer RLT and dissected. RNA from suprarenal aortas was prepared, and qPCR was performed as per Materials and Methods. Data reflect n ≥ 3 mice for each genotype and treatment condition. ∗, p < 0.01. B, LTB4 quantitation in whole mouse aortas of the indicated genotype and treatment as assessed by tissue ELISA as detailed in Materials and Methods. Data reflect n = 3 mice for each genotype and treatment condition. ∗, p < 0.05. To directly assess the functional role of BLT1 in AAA formation, we studied Blt1−/− mice that were first backcrossed 10 times into a C57BL/6J background and subsequently bred with Apoe−/− mice. Intercrosses of Apoe−/−/Blt1+/− mice yielded offspring that entered the study. After Ang II infusion, Apoe−/− and Apoe−/−/Blt1−/− mice had comparable lipid levels, white blood cell counts and blood pressures, thus excluding several potential confounding variables (Table I⇓). No aneurysms were detected in our prior studies of Apoe−/− and Apoe−/−/Blt1−/− mice without Ang II infusion (15). Multiple metrics were used to quantify aneurysm formation in Apoe−/− and Apoe−/−/Blt1−/− mice. We first assessed the incidence of aneurysms in the animal cohorts, defining an aneurysm as a dilation of the suprarenal aorta >1.5-fold the diameter of the infrarenal aorta, which is entirely spared from enlargement in this model (8, 24, 25). When present, aneurysms were located immediately above the takeoff of the right renal artery as previously reported (8, 24, 25). Representative aortas from each genotype and treatment arm are shown in Fig. 2⇓. As expected, the vehicle control had no effect on the aortas of either genotype. In contrast, we observed a significant reduction in aneurysm incidence in Ang II-treated Apoe−/−/Blt1−/− mice (13 of 27 positive; 48%) as compared with Apoe−/− mice (25 of 29 positive; 86%; p = 0.004; Fig. 3⇓A). The 86% incidence of Ang II-triggered aneurysm formation in Apoe−/− mice in this study was entirely consistent with previous reports (8, 24, 25). En face AAA analysis. Apoe−/− and Apoe−/−/Blt1−/− mice were treated with saline vehicle control or Ang II for 4 wk, and then aortas were dissected. Representative data from each genotype and treatment condition are displayed. Apoe−/−+ saline (n = 9); Apoe−/−+ Ang II (n = 29); Apoe−/−/Blt1−/− + saline (n = 9); Apoe−/−/Blt1−/− + Ang II (n = 27). No aneurysms were previously detected in our prior studies of Apoe−/− and Apoe−/−/Blt1−/− mice without Ang II infusion (15 ). Analyses of aortas from Ang II-treated mice. Before dissection, mice were randomly assigned for imaging analysis or for rapid processing for qPCR studies. A, Aneurysm incidence [(no. of mice with aneurysms)/(total no. of mice examined)]; Apoe−/− (n = 29), Apoe−/−/Blt1−/− (n = 27); ∗, p < 0.05). B, Maximum suprarenal/infrarenal diameter. n = 12 for each genotype; ∗, p < 0.05. C, Suprarenal/infrarenal area. n = 12 for each genotype; ∗, p < 0.001). D, Aneurysm area/infrarenal area. Apoe−/− (n = 9), Apoe−/−/Blt1−/− (n = 6), ∗, p < 0.05. To comprehensively assess the extent of aortic dilation in Apoe−/− and Apoe−/−/Blt1−/− mice, we also measured the ratio of maximum suprarenal diameter/infrarenal diameter, as well as the ratio of the suprarenal area (from the takeoff of the left subclavian artery to the left renal artery)/infrarenal area (from the left renal artery to the iliac bifurcation). As noted peviously, because Ang II infusion does not typically affect the infrarenal aorta, dividing through by the infrarenal diameter and area standardized for natural variation between mice. We found significant reductions in both the maximum suprarenal/infrarenal diameter (Fig. 3⇑B) and suprarenal/infrarenal area (Fig. 3⇑C) in the Ang II-treated Apoe−/−/Blt1−/− mice as compared with the Apoe−/− controls (diameter ratio, 1.75 ± 0.22 vs 2.55 ± 0.23, n = 12 for each genotype, p = 0.02; area ratio, 4.27 ± 0.16 vs 5.67 ± 0.29, n = 12 for each genotype, p < 0.001). Finally, we also calculated the two-dimensional area of aneurysms (when present) in all cohorts of mice. Even though fewer Apoe−/−/Blt1−/− mouse aortas developed aneurysms, when aneurysms did develop in this genotype they were smaller than those in the single knockout Apoe−/− control mice (aneurysm area to infrarenal area, 0.94 ± 0.28 vs 2.57 ± 0.43, p = 0.01; Fig. 3⇑D). Taken together, these data from multiple assessments suggest that BLT1 deficiency protects against AAA formation in this murine model. We next performed immunohistochemical studies of aortic vessel wall constituents to further delineate the effects of BLT1 on AAA formation. Fig. 4⇓ demonstrates representative findings from similar aortic segments of both genotypes. Overall, there were statistically significant decreases in both macrophage and CD4+ T cell accumulation in the aortas of the double knockout mice as compared with Apoe−/− controls (Fig. 4⇓C). We were interested to find that staining for SMCs, however, was not significantly different between the two genotypes (data not shown). Immunohistochemical analysis of suprarenal AAA. Images were obtained after 4 wk of Ang II treatment. A, Representative Mac3 staining for macrophages within Apoe−/−/Blt1−/− aneurysm lesions and Apoe−/− control mice. B, CD4 T cell staining. C, Quantitative analysis of percent positive Ab stain per lesion area in randomly selected high-powered fields. n ≥ 3 fields from at least 3 mice of each genotype; ∗, p < 0.001. To further dissect the mechanisms that are responsible for the protection from AAA formation seen in the Apoe−/−/Blt1−/− mice, we next performed qPCR on the vessel wall of mouse aortas from the two cohorts. These studies were performed specifically in nonaneurysmal segments to better understand the early signals that might be driving aortic changes before dilation. We reasoned that the profiling of fully established aneurysms, in contrast, might capture too many downstream, secondary phenomena from the massive injury associated with AAA. Several groups have recently reported studies suggesting an autocrine pathway by which LTB4 potentiates inflammatory responses by triggering the expression of the chemokine MCP-1 from leukocytes. MCP-1, in turn, recruits more mononuclear leukocytes which are a major source of LTB4 production (26, 27). We found a significant reduction in MCP-1 mRNA transcripts in the suprarenal aortas of Ang II-treated Apoe−/−/Blt1−/− mice as compared with those from the Ang II-treated Apoe−/− controls (Fig. 5⇓). Thus, deletion of BLT1 appears to prevent leukotriene-induced increases in vascular wall MCP-1 expression in vivo. Proinflammatory cytokine mRNA expression in suprarenal aortas by qPCR. After 4 wk of Ang II treatment, mice were sacrificed, aortas were perfused with buffer RLT and dissected, and mRNA from suprarenal aortas was prepared for qPCR as per Materials and Methods. Control or Ang II-treated C57BL/6J (Bl6), Apoe−/− and Apoe−/−/Blt1−/− aortic cDNA (n ≥ 6) was probed with primers for MCP-1, MIP-1α, and MIP-2. Data displayed represent mean normalized expression (to Apoe−/− + saline) of the indicated chemokine. ∗, p < 0.05. Zhao et al. (10) found that 5-LO deficiency significantly attenuates plasma MIP-1α, another monocyte chemoattractant associated with vascular pathology. We found a marked reduction in MIP-1α in the suprarenal aortas of Ang II-treated Apoe−/−/Blt1−/− mice as compared with those from the Ang II-treated Apoe−/− controls consistent with this prior study (Fig. 5⇑). We have previously implicated CXCR1 and CXCR2 in monocyte recruitment through chemokine-triggered arrest under physiological flow conditions (28). We observed a >6-fold reduction in the mRNA of MIP-2, a major CXCR2 ligand, in the suprarenal aortas of Ang II-treated Apoe−/−/Blt1−/− mice as compared with those from the Ang II-treated Apoe−/− controls (Fig. 5⇑). Taken together, these data thus suggest that BLT1 deletion interrupts macrophage inflammatory circuits. MMP2 and MMP9 have been reported to participate in the development of aneurysms, potentially by translating the inflammatory response into altered vessel wall integrity (29), although a role for BLT1 in modulating metalloproteinase expression in vivo has not been previously reported. Consistent with previously published data, MMP2 and MMP9 transcripts were significantly increased in aortic tissue from Ang II-treated Apoe−/− mice as compared with saline-treated Apoe−/− mice (Fig. 6⇓A). We were interested to find striking reductions in both MMP2 and MMP9 message in the suprarenal aortas from Ang II-treated Apoe−/−/Blt1−/− mice as compared with Ang II-treated Apoe−/− controls. In the double knockout mice, the MMP expression reverted back to baseline levels seen without Ang II infusion. The highly significant change effect of BLT1 deletion was further confirmed by immunohistochemical analysis of MMP2 and MMP9 in the vessel wall (Fig. 6⇓B). In contrast to the up-regulation of these specific monocyte chemoattractants and MMPs, there were no differences between Apoe−/−/Blt1−/− and Apoe−/− aortas in the expression of other relevant cytokines including IFN γ (IFN-γ), TGF-β1, and IL-5 (data not shown), suggesting that BLT1 altered only specific downstream pathways. In addition, we found no significant differences in immunostaining for 5-LO and LTA4 hydrolase between the two genotypes (data not shown). MMP expression in suprarenal aortas of Ang II-treated mice by qPCR and immunohistochemistry. For qPCR studies, mice were treated and samples prepared as above. A, Control or Ang II-treated C57BL/6J (Bl6), Apoe−/−, and Apoe−/−/Blt1−/− aortic cDNA (n ≥ 6) was probed with primers for MMP2 and MMP9. Data represent mean normalized MMP expression (to Apoe−/− + saline). ∗, p < 0.05. B, Immunohistochemical staining for MMP2 and MMP9 in representative suprarenal aneurysms, seen as the red reaction product. Recent studies (10) have demonstrated that LTD4 stimulation causes up-regulation of MIP-1α by murine MM6 monocytic cells and MIP-2 expression by HUVECs, suggesting that LTD4 might enhance recruitment of monocyte/macrophages to atherosclerotic tissue and thereby drive inflammatory signaling and aneurysm formation. In studies with human monocytes, we found LTB4 to be a more potent proinflammatory signal than LTD4. LTB4 increased transcript levels of the athero-associated chemokines MCP-1 (n ≥ 3, p < 0.0001; Fig. 7⇓), MIP-2 (n ≥ 3, p < 0.0001), and IL-8 (n ≥ 3, p < 0.001), whereas LTD4 had no significant effects on the expression of these chemokines. These findings were confirmed by ELISAs for MCP-1 (n = 3, p < 0.0001), MIP-2 (n = 3, p < 0.01) and IL-8 (n = 3, p < 0.01) performed on the monocyte cell supernatants. Concordant with a previous study (30), LTD4 stimulation did enhance transcript levels of IL-1, but to a lesser extent than LTB4 stimulation (data not shown). LTB4 stimulation of human monocytes. Freshly isolated human monocytes were stimulated with 100 nM LTB4, LTD4, or vehicle control, as indicated, for 6 h. A, After reactions were stopped on ice, RNA was extracted from cells, and qPCR was performed as above. Probes for the following transcripts were used: MCP-1, MIP-2, and IL-8. Bars, means (n = 3 for each condition, ∗, p < 0.001). B, ELISA results for MCP-1, MIP-2, and IL-8 in cell supernatants (n = 3 for each condition. ∗, p < 0.01. Animal and human studies have increasingly implicated the leukotriene synthesis pathway in chronic inflammatory diseases, including atherosclerosis and its related complications. In this study, we have shown that the absence of BLT1 confers a >2-fold decrease in aneurysm incidence, as well as concordant reductions in aortic dilation as assessed by multiple metrics. Absence of BLT1 in the vessel wall in turn triggered down-regulation of monocyte chemoattractants including MCP-1, MIP-1α, and MIP-2 and commensurate reduction in mononuclear cell accumulation. BLT1 deletion also led to marked decreases in the vessel wall expression of the metalloproteinases MMP2 and MMP9, both of which have been implicated in AAA formation. Our findings are consistent with a recent report linking leukotrienes specifically with AAA formation. In a cholate diet-triggered model of AAA, 5-LO deficiency strikingly diminished aneurysmal dilation in a hyperlipidemic mouse background (10). The study demonstrated that 5-LO+ macrophages localize to the adventitia of diseased mouse arteries and constitute a main component of aortic aneurysms. 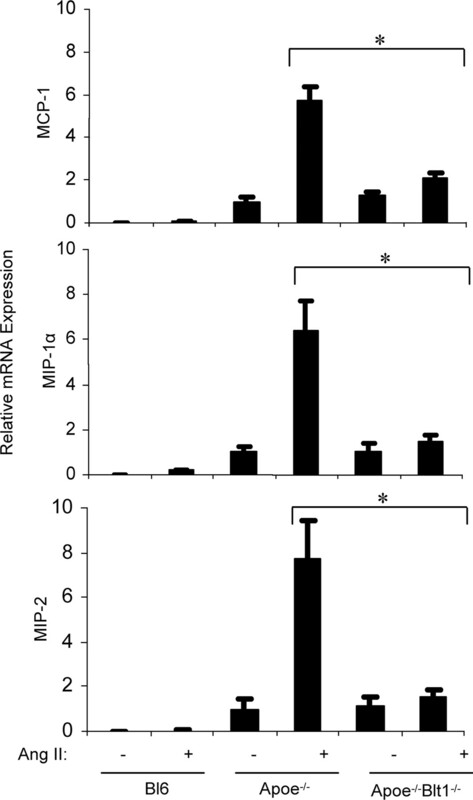 The study also found that 5-LO-deficient mice have reduced expression of MMP2 and MIP-1α. In vitro studies showed that LTD4 stimulation in murine MM6 cells caused up-regulation of MIP-1α transcripts, whereas in HUVECs it caused up-regulation of MIP-2. These data suggested that the decreased aneurysm incidence in the 5-LO knockout mice might be attributable to an absence of the proaneurysmal activity of the leukotrienes that are produced by 5-LO. The present findings, however, extend the previous work by defining LTB4, which signals primarily through its selective high-affinity G protein-coupled receptor BLT1, as contributing to AAA formation downstream of 5-LO. Although a role for the LTB4-BLT1 axis in atherosclerotic plaque formation was recently reported (15, 19, 31), its role in aneurysm formation was previously unknown. Indeed, an emerging line of evidence suggests that atherogenesis and aneurysm formation are inherently different processes; thus, modulation of the same signal in two disease models may not necessarily demonstrate concordant results. For example, whereas 5-LO deficiency markedly attenuated aneurysm formation, there was no significant effect on the formation of lipid-rich atherosclerotic plaques in a recent comprehensive analysis (10). Additionally, Saraff et al. (24) have demonstrated that in an Ang II model of AAA, atherosclerotic lesions were detected only after the development of the aneurysms. Because the knockout of BLT1 signaling had similar effects on both overall plaque development and AAA formation, in contrast to overall results seen with upstream 5-LO inhibition, pharmaceutical intervention aimed at this receptor may thus have multiple salutary effects on the vasculature. Recent studies demonstrating the function of novel, counterregulatory lipoxin A4 (4) metabolites of 5-LO (11) underscore the need for precise interventions in the leukotriene pathway to best target inflammatory processes. Huang et al. (26) recently demonstrated that primary human monocytes treated with LTB4 exhibit a striking, dose-dependent increase in MCP-1 expression at both the transcriptional and protein levels. The BLT1 receptor antagonist CP-105,696 significantly decreased this induction. The cysteinyl leukotrienes, LTC4, LTD4, and leukotriene E4, did not appear to be mediators of MCP-1 induction in this system. Furthermore, Matsukawa et al. (27) showed that administration of CP-105,696 in a murine model of acute septic peritonitis results in reduced MCP-1 levels in the peritoneum. In the present studies, the suprarenal aortas from Ang II-treated Apoe−/−/Blt1−/− mice had a substantially reduced message for MCP-1 as compared with Ang II-treated Apoe−/− controls. Thus, although cross-talk between LTB4 and MCP-1 has been suggested by recent papers, here we demonstrate novel in vivo evidence of decreased MCP-1 message in BLT1-deficient aortas specifically within the vessel wall. We also found reductions in message for the monocyte chemokines MIP-1α and MIP-2 in the BLT1-deficient aortas. MMP2 and MMP9 have been reported to participate in the development of aneurysms, potentially by translating the inflammatory response into altered vessel wall integrity (9). The MMPs and 5-LO have been implicated together in patients with clinical evidence of plaque instability. In a cohort of patients undergoing carotid endarterectomy, plaques from symptomatic patients contained a greater amount of 5-LO, MMP2, and MMP9 than those from asymptomatic patients (32). Furthermore, immunofluorescence showed that 5-LO and MMPs colocalized in activated macrophages. Our data therefore extend prior associative studies by demonstrating novel, striking effects of BLT1 deletion on MMPs in the vessel wall in vivo. Recent studies by our group (15, 33) and others (16) have demonstrated the inducible expression of BLT1 on previously unanticipated cell types, including SMC. 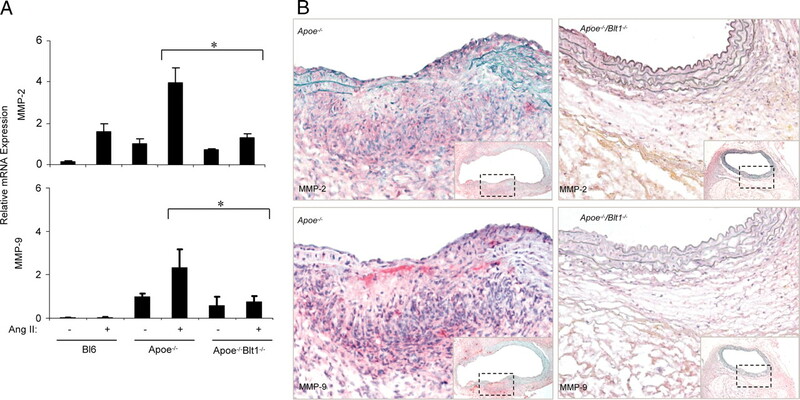 Indeed, in a prior study using a Western-style diet, there was a significant decrease in SMC accumulation in the atherosclerotic plaques of Apoe−/−/Blt1−/− mice as compared with the single-knockout Apoe−/− controls (15). In the present study, however, we observed no significant differences in SMC distribution in the AAA. The different findings between the two studies may be due to the different diets or the very different pathology generated by the Ang II infusion and also provide further evidence for differential signals modulating plaque formation vs AAA formation. The use of knockout mice in the present studies of course limited the scope of our investigation to interventions that precede the onset of the disease model. Future studies must also address whether pharmacological blockade of BLT1 can actually reverse the formation of AAA once present. Indeed, pharmacological inhibition of the JNK pathway conferred a striking reversal of AAA formation in an animal model (34); analogous studies with BLT1 antagonism would further enhance clinical relevance. In conclusion, our data have extended the role of the LTB4-BLT1 axis as critical to aneurysm formation in mice. As with classic peptide chemokines, the pleiotropic effects of lipid chemoattractants in disease contexts are increasingly appreciated. These findings are clinically relevant because small-molecule antagonists to BLT1 are under development and would thus target multiple vessel wall cell types and multiple vascular pathologies. ↵1 This work was supported by the National Institutes of Health (to R.E.G. and A.D.L. ), the American Heart Association (Grant-in-Aid to R.E.G. ), the Donald W. Reynolds Foundation (to R.E.G. and M.A. ), and a predoctoral award from the Sarnoff Cardiovascular Research Foundation (to N.A.). ↵3 Abbreviations used in this paper: 5-LO, 5-lipoxygenase; LTA4, leukotriene A4; LTB4, leukotriene B4; LTD4, leukotriene D4; AAA, abdominal aortic aneurysm; Ang II, angiotensin II; qPCR, quantitative RT-PCR; MMP, matrix metalloproteinase; SMC, smooth muscle cell. Spanbroek, R., R. Grabner, K. Lotzer, M. Hildner, A. Urbach, K. Ruhling, M. P. Moos, B. Kaiser, T. U. Cohnert, T. Wahlers, et al 2003. Expanding expression of the 5-lipoxygenase pathway within the arterial wall during human atherogenesis. Proc. Natl. Acad. Sci. USA 100: 1238-1243. De Caterina, R., A. Mazzone, D. Giannessi, R. Sicari, W. Pelosi, G. Lazzerini, A. Azzara, R. Forder, F. Carey, D. Caruso, et al 1988. Leukotriene B4 production in human atherosclerotic plaques. Biomed. Biochim. Acta 47: S182-S185. Qiu, H., A. Gabrielsen, H. E. Agardh, M. Wan, A. Wetterholm, C. H. Wong, U. Hedin, J. Swedenborg, G. K. Hansson, B. Samuelsson, G. Paulsson-Berne, J. Z. Haeggstrom. 2006. Expression of 5-lipoxygenase and leukotriene A4 hydrolase in human atherosclerotic lesions correlates with symptoms of plaque instability. Proc. Natl. Acad. Sci. USA 103: 8161-8166. Dwyer, J. H., H. Allayee, K. M. Dwyer, J. Fan, H. Wu, R. Mar, A. J. Lusis, M. Mehrabian. 2004. Arachidonate 5-lipoxygenase promoter genotype, dietary arachidonic acid, and atherosclerosis. N. Engl. J. Med. 350: 29-37. Helgadottir, A., A. Manolescu, A. Helgason, G. Thorleifsson, U. Thorsteinsdottir, D. F. Gudbjartsson, S. Gretarsdottir, K. P. Magnusson, G. Gudmundsson, A. Hicks, et al 2006. A variant of the gene encoding leukotriene A4 hydrolase confers ethnicity-specific risk of myocardial infarction. Nat. Genet. 38: 68-74. Helgadottir, A., A. Manolescu, G. Thorleifsson, S. Gretarsdottir, H. Jonsdottir, U. Thorsteinsdottir, N. J. Samani, G. Gudmundsson, S. F. Grant, G. Thorgeirsson, et al 2004. The gene encoding 5-lipoxygenase activating protein confers risk of myocardial infarction and stroke. Nat. Genet. 36: 233-239. Gitlin, J. M., D. B. Trivedi, R. Langenbach, C. D. Loftin. 2007. Genetic deficiency of cyclooxygenase-2 attenuates abdominal aortic aneurysm formation in mice. Cardiovasc. Res. 73: 227-236. Daugherty, A., M. W. Manning, L. A. Cassis. 2000. Angiotensin II promotes atherosclerotic lesions and aneurysms in apolipoprotein E-deficient mice. J. Clin. Invest. 105: 1605-1612. Thompson, R. W., P. J. Geraghty, J. K. Lee. 2002. Abdominal aortic aneurysms: basic mechanisms and clinical implications. Curr. Probl. Surg. 39: 110-230. Zhao, L., M. P. Moos, R. Grabner, F. Pedrono, J. Fan, B. Kaiser, N. John, S. Schmidt, R. Spanbroek, K. Lotzer, et al 2004. The 5-lipoxygenase pathway promotes pathogenesis of hyperlipidemia-dependent aortic aneurysm. Nat. Med. 10: 966-973. Levy, B. D., G. T. De Sanctis, P. R. Devchand, E. Kim, K. Ackerman, B. A. Schmidt, W. Szczeklik, J. M. Drazen, C. N. Serhan. 2002. 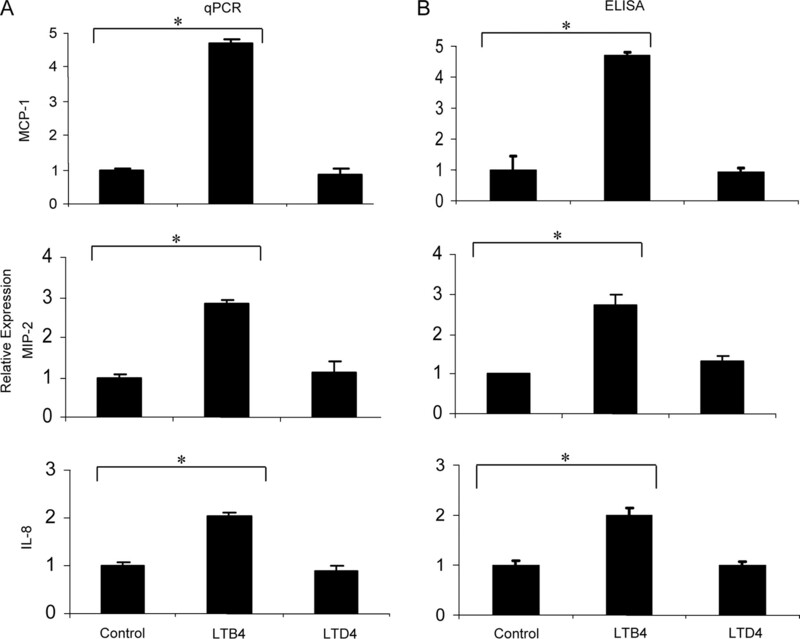 Multi-pronged inhibition of airway hyper-responsiveness and inflammation by lipoxin A4. Nat. Med. 8: 1018-1023. Tager, A. M., J. H. Dufour, K. Goodarzi, S. D. Bercury, U. H. von Andrian, A. D. Luster. 2000. BLTR mediates leukotriene B4-induced chemotaxis and adhesion and plays a dominant role in eosinophil accumulation in a murine model of peritonitis. J. Exp. Med. 192: 439-446. Borgeat, P., et al 1979. Transformation of arachadonic acid by rabbit polymorphonuclear lymphocytes. J. Biol. Chem. 254: 2643-2646. Ford-Hutchinson, A. W., et al 1980. Leukotriene B4, a potent chemokinetic and aggregating substance released from polymorphonuclear lymphocytes. Nature 286: 264-265. Heller, E. A., E. Liu, A. M. Tager, S. Sinha, J. D. Roberts, S. L. Koehn, P. Libby, E. R. Aikawa, J. Q. Chen, P. Huang, et al 2005. Inhibition of atherogenesis in BLT1-deficient mice reveals a role for LTB4 and BLT1 in smooth muscle cell recruitment. Circulation 112: 578-586. Back, M., D. X. Bu, R. Branstrom, Y. Sheikine, Z. Q. Yan, G. K. Hansson. 2005. Leukotriene B4 signaling through NF-κB-dependent BLT1 receptors on vascular smooth muscle cells in atherosclerosis and intimal hyperplasia. Proc. Natl. Acad. Sci. USA 102: 17501-17506. Yokomizo, T., K. Kato, K. Terawaki, T. Izumi, T. Shimizu. 2000. A second leukotriene B4 receptor, BLT2: a new therapeutic target in inflammation and immunological disorders. J. Exp. Med. 192: 421-432. Tager, A. M., A. D. Luster. 2003. BLT1 and BLT2: the leukotriene B4 receptors. Prostaglandins Leukot. Essent Fatty Acids 69: 123-134. Subbarao, K., V. R. Jala, S. Mathis, J. Suttles, W. Zacharias, J. Ahamed, H. Ali, M. T. Tseng, B. Haribabu. 2004. Role of leukotriene B4 receptors in the development of atherosclerosis: potential mechanisms. Arterioscler. Thromb. Vasc. Biol. 24: 369-375. Plump, A. S., J. D. Smith, T. Hayek, K. Aalto-Setala, A. Walsh, J. G. Verstuyft, E. M. Rubin, J. L. Breslow. 1992. Severe hypercholesterolemia and atherosclerosis in apolipoprotein E-deficient mice created by homologous recombination in ES cells. Cell 71: 343-353. Kuhlencordt, P. J., J. Chen, F. Han, J. Astern, P. L. Huang. 2001. Genetic deficiency of inducible nitric oxide synthase reduces atherosclerosis and lowers plasma lipid peroxides in apolipoprotein E-knockout mice. Circulation 103: 3099-3104. Bjorkbacka, H., V. V. Kunjathoor, K. J. Moore, S. Koehn, C. M. Ordija, M. A. Lee, T. Means, K. Halmen, A. D. Luster, D. T. Golenbock, M. W. Freeman. 2004. Reduced atherosclerosis in MyD88null mice links elevated serum cholesterol levels to activation of innate immunity signaling pathways. Nat. Med. 10: 416-421. Gerszten, R. E., E. B. Friedrich, T. Matsui, R. R. Hung, L. Li, T. Force, A. Rosenzweig. 2001. Role of phosphoinositide 3-kinase in monocyte recruitment under flow conditions. J. Biol. Chem. 276: 26846-26851. Saraff, K., F. Babamusta, L. A. Cassis, A. Daugherty. 2003. 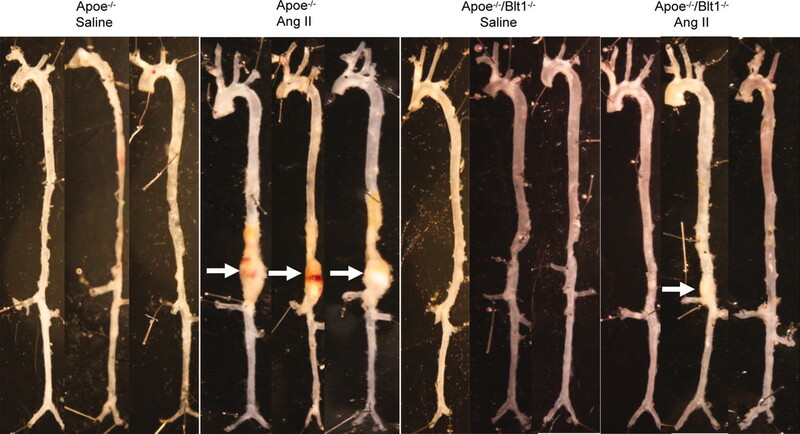 Aortic dissection precedes formation of aneurysms and atherosclerosis in angiotensin II-infused, apolipoprotein E-deficient mice. Arterioscler. Thromb. Vasc. Biol. 23: 1621-1626. Bruemmer, D., A. R. Collins, G. Noh, W. Wang, M. Territo, S. Arias-Magallona, M. C. Fishbein, F. Blaschke, U. Kintscher, K. Graf, R. E. Law, W. A. Hsueh. 2003. Angiotensin II-accelerated atherosclerosis and aneurysm formation is attenuated in osteopontin-deficient mice. J. Clin. Invest. 112: 1318-1331. Huang, L., A. Zhao, F. Wong, J. M. Ayala, M. Struthers, F. Ujjainwalla, S. D. Wright, M. S. Springer, J. Evans, J. Cui. 2004. Leukotriene B4 strongly increases monocyte chemoattractant protein-1 in human monocytes. Arterioscler. Thromb. Vasc. Biol. 24: 1783-1788. Matsukawa, A., C. M. Hogaboam, N. W. Lukacs, P. M. Lincoln, R. M. Strieter, S. L. Kunkel. 1999. Endogenous monocyte chemoattractant protein-1 (MCP-1) protects mice in a model of acute septic peritonitis: cross-talk between MCP-1 and leukotriene B4. J. Immunol. 163: 6148-6154. Gerszten, R. E., E. A. Garcia-Zepeda, Y. C. Lim, M. Yoshida, H. A. Ding, M. A. Gimbrone, Jr, A. D. Luster, F. W. Luscinskas, A. Rosenzweig. 1999. MCP-1 and IL-8 trigger firm adhesion of monocytes to vascular endothelium under flow conditions. Nature 398: 718-723. Longo, G. M., W. Xiong, T. C. Greiner, Y. Zhao, N. Fiotti, B. T. Baxter. 2002. Matrix metalloproteinases 2 and 9 work in concert to produce aortic aneurysms. J. Clin. Invest. 110: 625-632. Rola-Pleszczynski, M., I. Lemaire. 1985. Leukotrienes augment interleukin 1 production by human monocytes. J. Immunol. 135: 3958-3961. Aiello, R. J., P. A. Bourassa, S. Lindsey, W. Weng, A. Freeman, H. J. Showell. 2002. Leukotriene B4 receptor antagonism reduces monocytic foam cells in mice. Arterioscler. Thromb. Vasc. Biol. 22: 443-449. Cipollone, F., A. Mezzetti, M. L. Fazia, C. Cuccurullo, A. Iezzi, S. Ucchino, F. Spigonardo, M. Bucci, F. Cuccurullo, S. M. Prescott, D. M. Stafforini. 2005. Association between 5-lipoxygenase expression and plaque instability in humans. Arterioscler. Thromb. Vasc. Biol. 25: 1665-1670. Tager, A. M., S. K. Bromley, B. D. Medoff, S. A. Islam, S. D. Bercury, E. B. Friedrich, A. D. Carafone, R. E. Gerszten, A. D. Luster. 2003. Leukotriene B4 receptor BLT1 mediates early effector T cell recruitment. Nat Immunol. 4: 982-990. Yoshimura, K., H. Aoki, Y. Ikeda, K. Fujii, N. Akiyama, A. Furutani, Y. Hoshii, N. Tanaka, R. Ricci, T. Ishihara, et al 2005. Regression of abdominal aortic aneurysm by inhibition of c-Jun N-terminal kinase. Nat. Med. 11: 1330-1338.